In 2002 the Philippine government decided to expand palm oil cultivation in the archipelago to reduce imports and to fulfil the country’s rapidly growing domestic consumption. Attracted by promises of increased incomes, many residents signed-over a proportion of their private farmland for palm oil cultivation. But the farmers say they’ve yet to receive payment, and are even being held responsible for the plantations’ setup and loan costs. 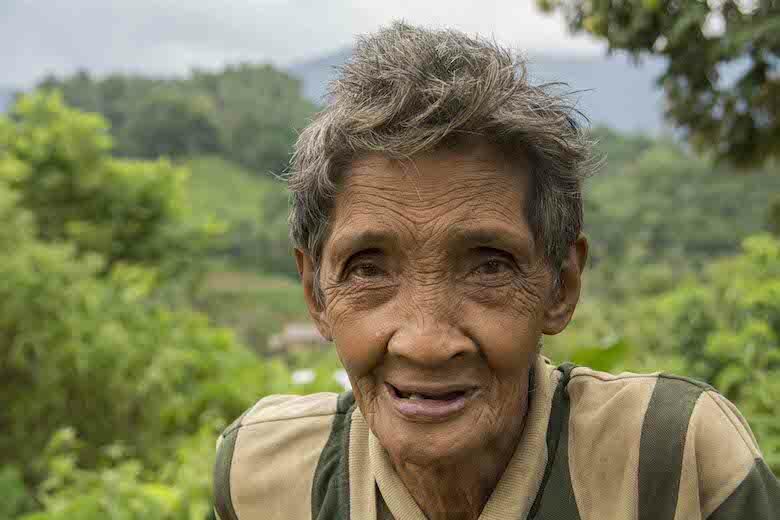 A tribal elder from the Tagbanua tribe in Quezon municipality, central Palawan. Photo by Rod Harbinson. Residents of Palawan Island in the Philippines have united to take on the companies that they say have grabbed their land. Seventeen indigenous communities on this island province are campaigning for justice from the companies that have grown palm oil on their farms. Palawan is a large island-province of the Philippines that lies midway between the rest of the archipelago and Borneo. The great beauty and biological value of the island was validated in 1990 when the United Nations Educational, Scientific and Cultural Organization (UNESCO) conferred the status of “Man and Biosphere Reserve” on this tropical paradise. In recent years, however, there has been an onslaught from mining and agribusiness keen to exploit its natural resources. Palawan’s pristine coastline gives way to coconut palms and then lush rolling forested hills speckled with tribal houses. This municipality of Quezon in central Palawan is the domain of the Indigenous Tagbanua people . They say a proportion of their lands have now been appropriated for palm oil cultivation. In 2002 the Philippine government decided to expand palm oil cultivation in the archipelago to reduce imports and to fulfill the country’s rapidly growing domestic consumption. That same year, the Department of Agriculture calculated that average palm oil production was 54,333 metric tons, with consumption running at 94,400 metric tons. Growing demand was expected to have reached 171,700 tons by 2015. A large palm oil plantation in southern Palawan. Photo by an anonymous source. Primary forest displaced for palm oil production on Palawan. Photo by an anonymous source. Two major palm oil companies operate in Palawan: Palawan Palm & Vegetable Oil Mills, Incorporated (PPVOMI) and Agumil Philippines, Incorporated (AGPI). PPVOMI is 60 percent Singapore-owned and 40% Filipino, whereas AGPI is 75% Filipino-owned and 25% Malaysian. The parent company of AGPI is Malaysian-registered Agusan Plantations Incorporated. Other smaller companies are also joining in the “golden oil” rush. AGPI has established a palm oil mill in the Municipality of Brooke’s Point for the processing of plantation harvests. As such, it buys 100 percent of the PPVOMI production. With 70 percent of processed oil due to be exported to Singapore, China and Malaysia, the original rationale to supply domestic production appears to have been contradicted. In deals struck with palm oil companies, different communities in central and southern Palawan agreed to lease areas of their farm and forest land in return for a share of the income from the palm oil profits. In other cases, local people leased parcels of land under customary native title to palm oil companies at low rents. 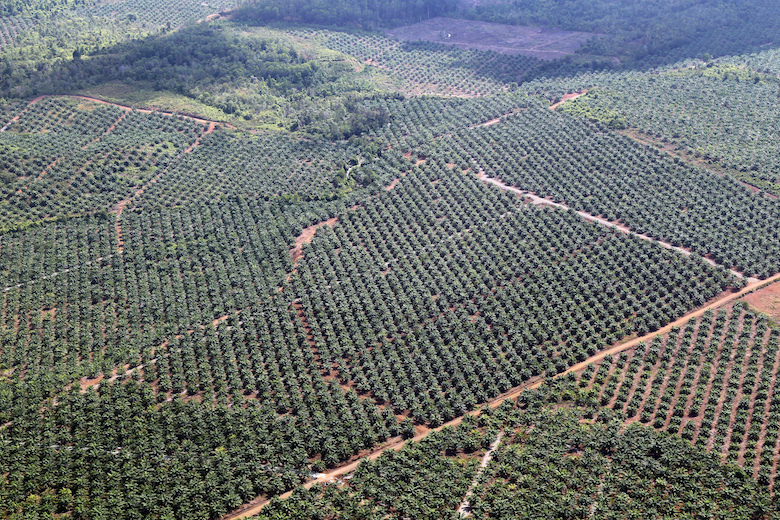 “We wanted to plant palm oil because the conditions were good. The conditions offered by the companies. But until now, it has been six years and we have not received any benefits,” said Graciano Muniz, tribal farmer from Aramaywan community [Baringay], in the municipality of Quezon in central Palawan. 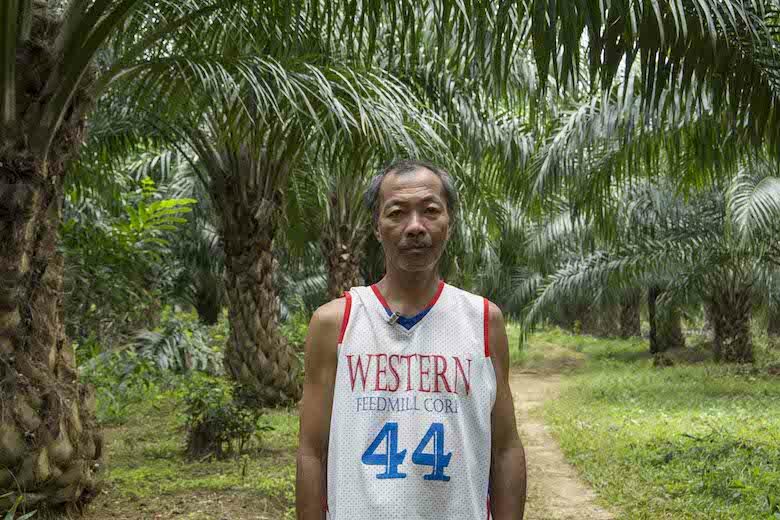 Graciano Muniz stands in a palm oil plantation planted on his land in Aramaywan community, Quezon municipality, Palawan. Photo by Rod Harbinson. In the seven years since the first leases began, none of the participating cooperatives have reportedly received a single payment, despite four years of harvest since the plants reached production maturity at around three years. “The landowners were fooled by this company. To the extent that prior to that they have lands to till, they have lands to plant the crops for their living,” said Rodiar Carlio, a member of the Coalition against Land Grabbing (CALG), an NGO galvanizing resistance to the palm oil companies in Aramaywan and neighboring communities. He is negotiating with AGPI for a solution to the dispute. Palm oil has increasingly entered our food supply chain in the past 20 years and is now found in a multitude of consumer items from biscuits to shampoo. Viewed by food companies as a wonder crop, the prolific harvests of palm fruit are rich in saturated oil. However, the crop has courted controversy wherever it has been grown. Huge swathes of the great tropical forests on the island of Borneo have been felled to make space for oil palm plantations. Since then, cultivation has continued to spread throughout Southeast Asia – and even into Africa (where the wild oil palm originates) and South America – to feed an insatiable demand for the golden oil. When sales teams from AGPI originally came knocking seven years ago, some tribal and farm communities were attracted to the high incomes the company promised relative to their dominant cash crop of coconut palm – which is still widely cultivated. Many signed-over a proportion of their private farmland for palm oil cultivation. Roberto Bardolassa is one of these farmers. He moved to Palawan in 2007 from Rizal Island to cultivate his wife’s land. “At that time the company was organizing and looking for landowners to cooperate with their company…so we decided to be their partner,” Bardolassa said. 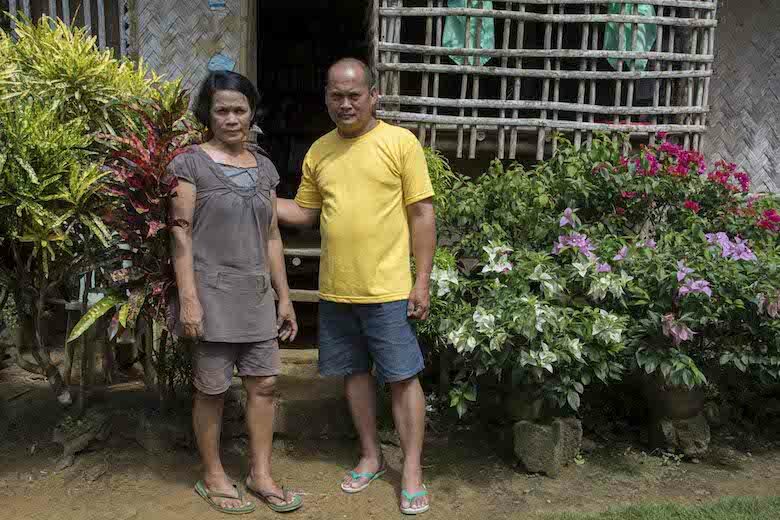 Roberto Bardolassa stands with his wife in front of their family home in Aramaywan village. He says he has lost land to AGPI. Photo by Rod Harbinson. Some elderly farmers told Mongabay they found the scheme especially attractive because the company promised to arrange the plantation maintenance labor and provide steady income that would ensure pensions. Pasteur Motalib Kemil, tribal leader of the Tagbanua tribe, Aramaywan community [Baringay], in the municipality of Quezon, is Chairman of CALG. 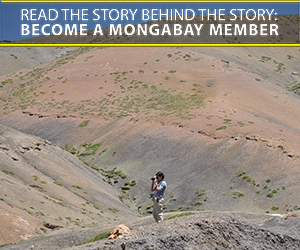 He told Mongabay that the 25-year contract was written in English, which the vast majority of farmers did not understand. He explained that officials from the tribal cooperatives often signed up on behalf of participating farmers and the title deeds for the land were handed over to the company for safekeeping. Kemil says he is not alone in suspecting that the company has passed the farmers’ land title deeds to the Land Bank of the Philippines (a government lender) as collateral to secure the loans used to set up the plantations. “We haven’t received any payment for rental of our farmland – it has all gone to the Land Bank that provided the loan. These farmers provided their land titles as collateral to the Land Bank and it takes 25 years to pay before they receive their share of the profits from the harvest,” Boy Soda, elected representative of the Palawan Tribe from Baringay Salogunin in the Brooks Point municipality told Mongabay. Land clearance and planting of the young palm oil saplings was then billed to the farmers as a loan incurring 14 percent interest annually. Farmers complain that many of the contractual details were kept hidden. 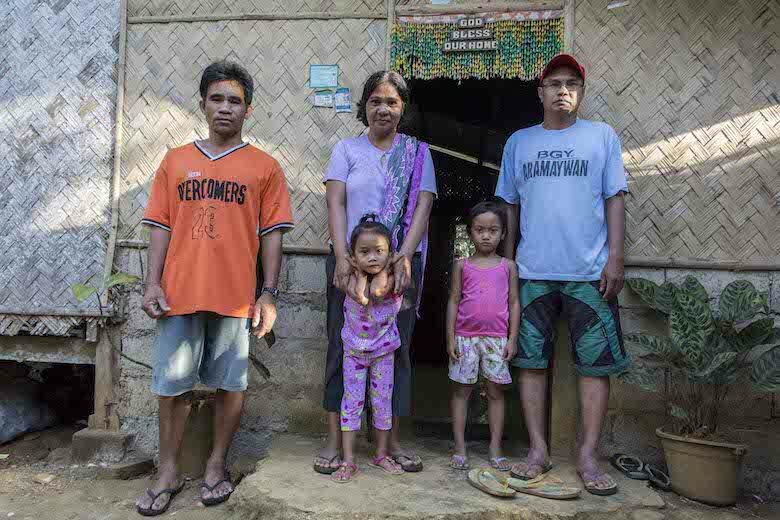 Pasteur Montlib Kemil (right), stands with his family outside the family house in Aramaywan village. He is a tribal leader of the Tagbanua tribe in the municipality of Quezon and works with the NGO coalition Ancestral Land Domain Watch (ALDAW). Photo by Rod Harbinson. The farmers had expected that their income would begin once the palm oil trees had matured to harvest stage, around three years. They had not expected to have to pay the setup costs and the onerous rates of interest from the Land Bank, and they claim they were deceived throughout the contractual negotiations. Motalib Kemil shares Carlio’s opinion that once all costs are deducted from income accrued from the harvest, the farmers are unlikely to receive anything over the 25 year period, even if the company intended to make payments, which it shows no sign of doing. Many of the farmers fear that the debt mountain they have been duped into accumulating will mean that they will never see their land again. Part of the problem, according to Motalib, is that loan payments are insufficient because the size of the harvest has fallen short of that promised by the company. 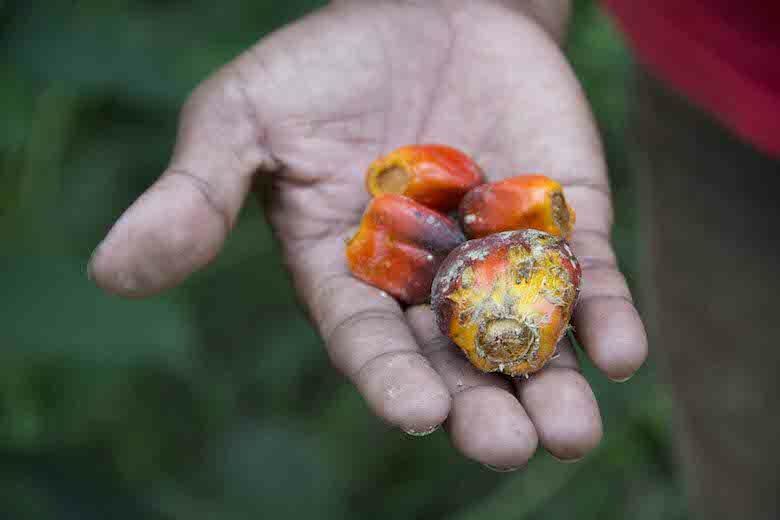 In addition, Motalib explained that because it has a monopoly on processing, the company sets the price per kilogram it will pay for the palm oil fruit, which he complains is lower than the global commodity price. Since AGPI began operations, it has made deals with six municipalities in central and southern Palawan (the target area for oil palm development spans the municipalities of Aborlan, Narra, Quezon, Sofronio Española, Brooke’s Point, Rizal and Bataraza) for rent or purchase of around 6,000 hectares. However, its sales teams are still active on the island trying to meet their 20,000-hectare target. As word spreads about payment failures, fewer tribal people and farmers are inclined to sign leases, according to Motalib. “I think it will be very hard to meet this target because now farmers do not want to sell because they have heard about the bad experiences of other farmers,” he said. Harvested palm oil fruit is taken to the AGPI processing plant at Brookes Point in central Palawan and from there it is shipped to other islands such as Cebu, and also abroad to China, Malaysia and Singapore. A tribal farmer shows the palm oil fruit in a plantation in central Palawan, Philippines. Oil is produced by pressing the fruit. Photo by Rod Harbinson. Tribal representatives are disappointed with the lack of support they have received from state institutions for their plight. None seem prepared to help them. “It would appear that Agumil and other oil palm enterprises have bypassed, with impunity, the Strategic Environment Plan (SEP), the very law which should ensure sustainable development and environmental protection in Palawan,” said Marivic B. Bero, CALG Secretary General. She explained that state institutions including the Palawan Department of Environment and Natural Resources (DENR) and the Committee for Sustainable Development (CSD) are both responsible for failing to properly enforce SEP regulations restricting land clearance. Mongabay approached Agumil, Land Bank, the governor’s office, DENR and the CSD for their reactions to the criticisms of the cooperatives. No responses were forthcoming. In 2004, the provincial board of the governor’s office passed Provincial Ordinance No. 739-04 promoting development of the palm oil industry and it is understood by tribal leaders that this remains its position. It was the culmination of a period of promotion by then-Governor Joel Reyes who successfully invited palm oil companies to Palawan. Promotion led to the creation of the Palawan Palm Oil Industry Development Council (PPOIDC), a multi-agency body tasked with promoting the palm oil sector in Palawan and ensuring that developments such as construction of a refinery took place. Since oil palm plantations have rolled out across the landscape, farmers claim that new previously unknown agronomic problems have surfaced. For instance, the palm trees require high water usage, which can come at the expense of neighboring crops. “Our discovery, is that palm oil [trees] absorbs a bunch of water compared to other trees, so if your land is planted by palm oil forget it. Only because of the palm oil, you can’t plant any more other crops,” Carlio said. In addition, the oil palms possess very thick and deep root formations that are difficult to remove. According to Carlio, the plantations use high levels of external inputs like pesticides and herbicides and these too are having knock-on environmental effects. Cousin of Pasteur Montlib Kemil lives on the coast in Aramaywan community amongst the coconut trees. She and her family still continue this traditional livelihood which is becoming displaced as palm oil plantations expand in central Palawan. Photo by Rod Harbinson. “Some studies show that the insects that destroy the coconuts in the province emanate from the palm oil. But the company denied that. So we are using pesticides, especially the people who are engaged in coconut planting. So their coconuts are dying because [of] that insect that is destroying the coconut. Prior to the existence of palm oil in the province there was no such thing as that insect that destroys the coconut,” Carlio said. A 2013 report by ALDAW supports Carlio’s suspicions. Graciano Muniz has made a pragmatic work transition to cultivating seaweed for the Chinese pharmaceutical market. “These days I don’t join in farming palm oil. We earn our living from the sea. Farming in the sea,” he said. Local radio journalist and environmental campaigner Gerry Ortega, was gunned down in January 2011 in Palawan capital Puerto Princesa, reportedly for his staunch anti-mining campaigning. Agence France Presse reported in March 2011 that Ortega was the latest in a line of at least four campaigners who lost their lives for speaking out against resource exploitation in Palawan. Bardolassa is adamant that he will continue his fight for justice, despite what happens. In late September, CALG submitted a petition signed by 4,200 farmers and indigenous residents to Palawan Vice-Governor Dennis Socrates, calling for a moratorium of palm oil expansion on the island.